New, weird lands await discovery! The setting of Numenera is unlike any other gaming setting, taking place more than a billion years in the future, where technology is indistinguishable from magic. And it just got more than twice as big! 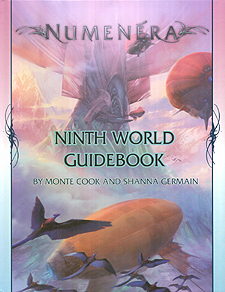 The Ninth World Guidebook takes your campaign into uncharted territory, expanding the setting beyond the border of regions presented in the Numenera core book. This 256-page tome explores lands hinted at in previous books, opens new territories, and adds detail to the Steadfast and the Beyond. From the frozen lands beyond the Southern Wall to the mysterious archipelago of the Rayskel Cays, from the volcanic desert of Vralk and the potential threat of the Gaian land of Lostrei to the far-off realm of Corao and the other Lands of the Dawn, the Ninth World Guidebook offers adventure hooks, new NPCs, and the incredible level of detail, imagination, and weirdness you already love about Numenera!